The annual bunfight known as the Telegraph Ways With Words. 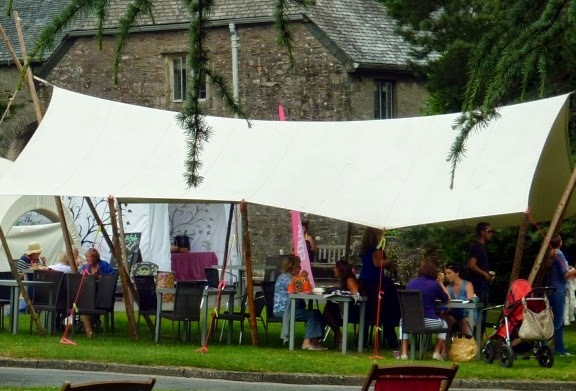 a Festival of Words and Ideas is under way here in Dartington. That is an interesting title for this festival: when you look at the Ways With Words website the bye-line says “Literature Festivals and Writing Holidays”. 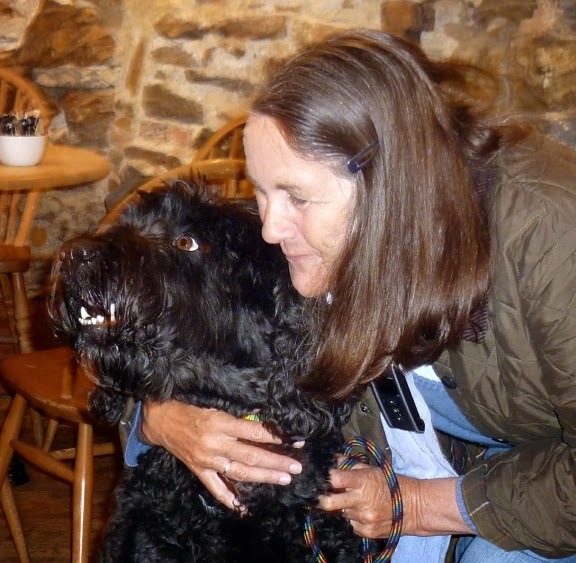 Whilst Marcia has been attending quite a few of the events, I have been brooding on what seems to me to be rather a mixed message and thus on to asking myself what makes writing “literature”. I suspect, as Bob Dylan put it, The Times They Are A Changin’. 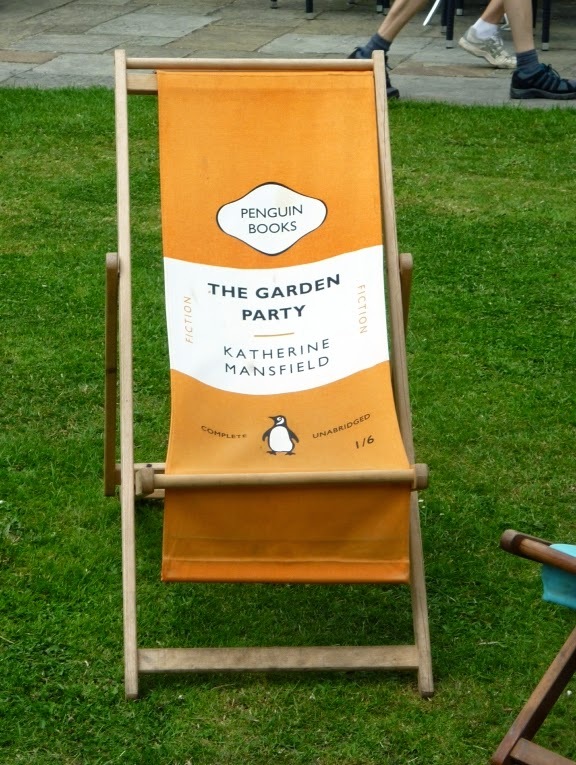 Where else would you see such a deck chair? Fifteen years ago, most of the speakers here would have been people who made a living by writing and many of them would have been novelists. Not so today. Like all such festivals, the speakers tend to be people who are, for one reason or another, in the public eye. True, they have all written books but they are here not because they are great writers but because they are the sort of people that draw crowds. Some of them have even written a novel. Perhaps surprisingly, I am very glad that there are these celebrity writers – they help to support an industry (book publishing) that is in serious trouble and without which “working novelists” such as Marcia would be out of a job. 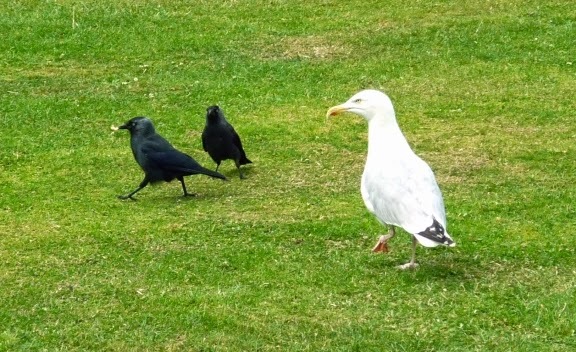 The jackdaws and gulls were busy cleaning up the remains of people's picnics. All of this has made me think about what is meant by “literary”. According to my Oxford dictionary, literature is defined as: “Written works, especially those considered of superior or lasting artistic merit“. From that one would assume that a literary festival would have such works at its centre. 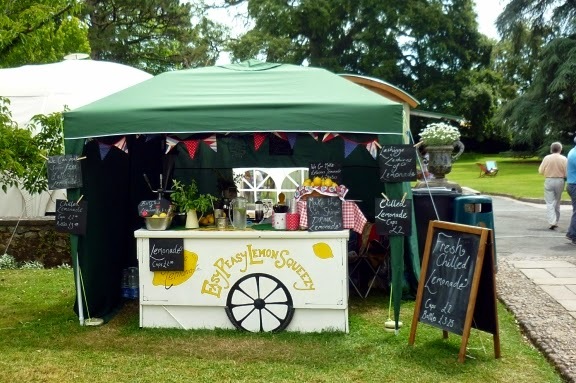 Clearly matters have moved on: literary festivals are (like any other business) trying to make a profit and we live in the age of the celebrity. The result is that this festival has only a few novelists in the programme. Having said that, Marcia was thrilled to be able to go and hear Helen Dunmore and Jane Gardam (two of her favourites) and hopes to meet up with our old friend James Long whom we haven’t seen since he moved up to Bristol some years ago. The birds weren't the only ones here to work. Waterstone's marquee stocks all the books being discussed at the festival. 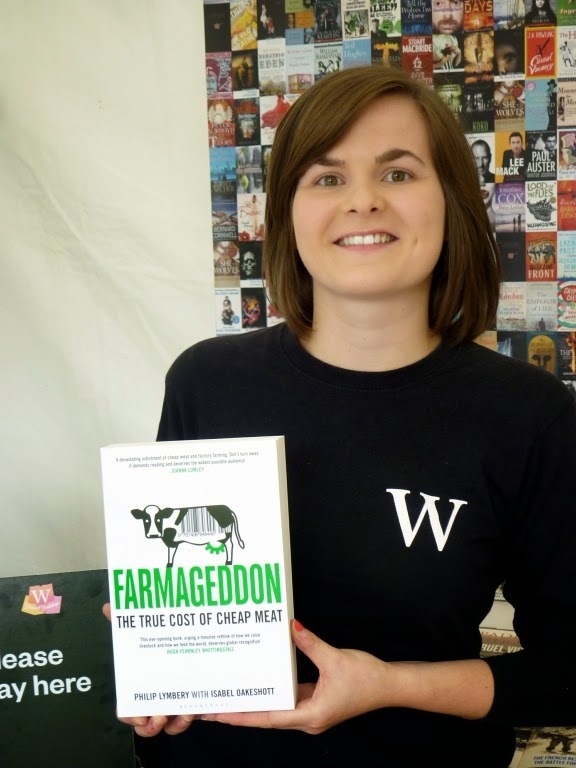 Here is Emma-Louise holding Farmageddon - a terrifying book about the consequences of factory farming, was written by Philip Lymbery with Isabel Oakeshott. Mr Lymbery was kind enough to give me an interview before his talk. If you would like to see what he had to say, please CLICK HERE. To me creative writing is at its peak when the writer can so describe landscape as to enable the reader to smell the heather, the sea or whatever and to bring such life to the characters that the reader can really fall in love with them. Hacks, people like me, who write about factual events (be that as as a journalist, a newspaper commentator, a biographer or technical writer) can write well or badly but they will never meet that definition of literature. Let me give you an example. The Great War in Europe in the years 1914 to 1918 was one of the most horrific moments in the history of the world and one that has long fascinated me. I have never really understood why it happened nor why for four long weary years there was a military deadlock. I have read a fair number of historical books dealing with the period just before and during that war but none has ever created the sort of emotional connection that one needs properly to understand such events. 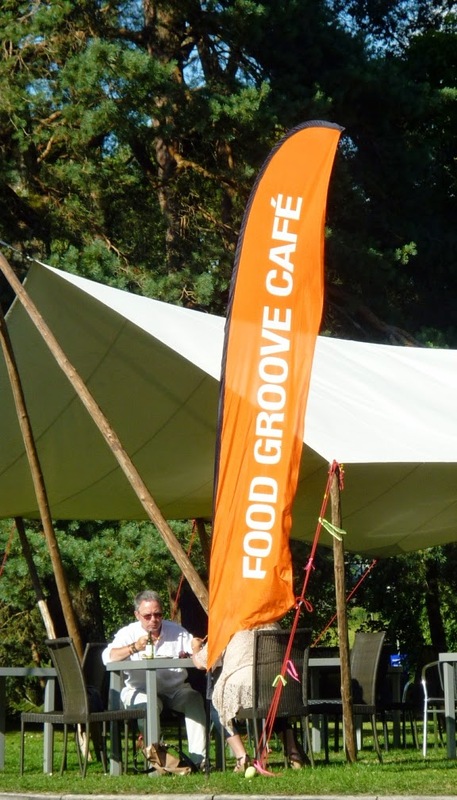 All the tents, stalls and banners really did create a great "vibe" at Dartington. Then I read Ken Follett's “The Century Trilogy”: The Fall of Giants, The Winter of the World and The Edge of Eternity. Although the fact that nobody seemed able to stop almost sleep walking into the war, I now have a far greater understanding of how people felt at the time and not just on one side of the conflict but from all sides. Is that great literature? 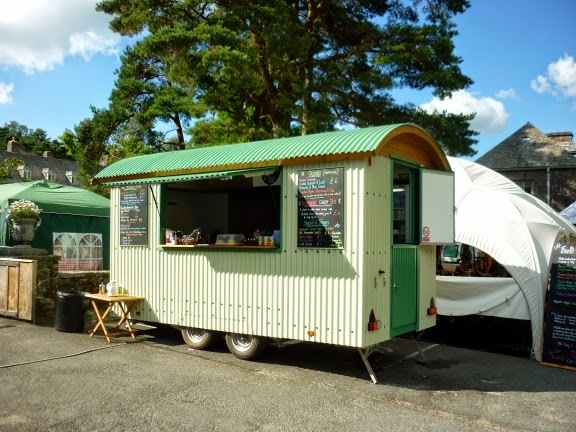 Most critics would not rate Ken Follet that highly but he managed to speak to me and I know from all the messages we receive (by comments on the blog, emails and letters) that Marcia speaks to all of you. What more can a novelist hope to achieve? She just can't help herself. Cuddles with Willow who (quite reasonably) is seeking reassurance from her owner.